The number of Wani is said to be increasing at mixed baths in Japan. 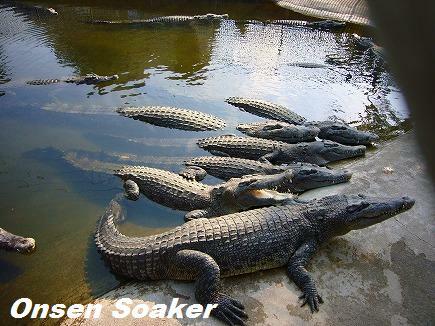 The Japanese word "Wani" stands for both crocodiles and alligators. Maybe you say "Hey, you share an onsen bath with crocodiles and alligators in Japan? Isn't it too dangerous?" Well, wani appearing at onsen is different from ordinary wani and often described as "Wani Otoko" (Crocodile Man or Alligator Man) as well. Many Japanese except onsen enthusiasts doesn't know its existance yet. It has following characteristics. Habitat: Gender mixed baths, especially open-air baths not far away from big cities (within 2-3 hours). Followings are tips for ladies to avoid wani and unpleasant experience at mixed bath. If you have other suggestions, please leave a comment. 1) Go with your husband or boyfriend. Wani never stares at ladies with male partners. 2) Go with your friends. I think three or four of you is enough to drive wani out. Just stare at him and chuckle. Less possibility to meet wani on weekdays, in the early morning, and in the night. Some onsens with mixed baths set "ladies only time". Soaking towels in the bath tub is generally against bathing manner in Japan, but many onsens with mixed bath allow ladies to wrap their body with bath towels. Some onsens aren't transparent. If you soak yourself in a muddy or milky white onsen, you don't have to care about being watched at least while soaking. He or she will drive wani out, I hope. But wani knows unstrict onsens and onsens without managers. If you meet a wani unfortunately, just talk to him "Wani desuka? (Are you a wani?)" I think he will leave. But if he answers "Yes, so what?" I have no idea what to say next. There are many good gender separated onsens in Japan. If you just want an onsen experience, you don't have to persist with a mixed bath. Go to the onsen allow swimsites bathing. But swimsuites bathing is different from our onsen culture. The onsen is to soak in a bath in your birthday suites, not in a pool with swimsuites, I guess. Finally, I want to suggest wanis to take advantage of their special talent in different fields. How about trying a Guiness World Record of "Keep eyes open without blinking"? The tips though helpful, but many take away from the enjoyment altogether or not? The Japanese culture of onsen has much in common with at least in Holland and Germany the culture of sauna. Never saw croc's in sauna's... Though increasingly to make money the sauna's are looking at bathing suits days to attract new customers. Onsen soaking manner is rapidly changing or disappearing. I don't know European manner, but showing your private parts was supposed to be rude even among same gender in Japan until recently. My grandma told me to hang towel in front of my body at my breasts, and roll up when I step in the bath (The Japanese hate to soake towels into the tub). She did it elegantly, never soaked towel, never showed her private parts. it was state of the art. Men used to hold towels at their lower bellies. But it's changing. Older generation complain we loose shyness and getting closer to monkeys. Saru (monkeys) and wani are good coupling maybe. The T-shirt on the page you linked is good for you, I mean visitors from abroad. Some Japanese will smile and talk to you. As for Japanese, it's good for joking among friends, but I don't know how strangers react. I think none of your friends in Japan know about wani yet. A few cases my wife went to thelady only bath, or she weared a large towel, but the feeling of soaking changed for her. Unfortunnaly we have the same kind of problems in some sauna in Europe. Now in some sauna clubs only known members, or familly are acepted. I can imagine how your wife felt. All I can do is writing this post for warning. Wanis even travel to Europe. A friend of mine found a Japanese wani at the Friedrich SPA? at Baden, Germany. I saw my first wani at Hoyurando in Beppu. Great bath, but this big fat gross guy just stood staring a the female entrance to the rotenbro the entire time I was there. Gross. That night, I had a conversation about those people with a fellow bather at the local hostel. He had seen the same guy before. They are ruining a great Japanese tradition. It's like littering in a temple. Thanks for the great post about this, and for teaching me what they are called. If they say "so what," my recommendation would be to insult his manhood (physical and emotional) or do what ever you can to draw as much attention to the guy so the other bathers get involved. Why let them ruin your experience. Beppu Hoyoland is a famous wani spot or a wani farm. Fortuunately, when I visited there, I met a big group of aged Korean ladies, and I soaked with them. No wani came around and I enjoyed wonderful mud bath. Yup i was there earlier this year and it was infested with wani. So many wani just hanging around looking at every female that goes into the bath. When this gal stood up a little you can suddenly see the wani getting excited.